I bought I new PC system, based on a motherboard with the H57 chipset and the intel core i3 530 CPU. After a faultless installation of openSUSE 11.2, I had some initial problems getting the integrated Intel HD graphics to work. 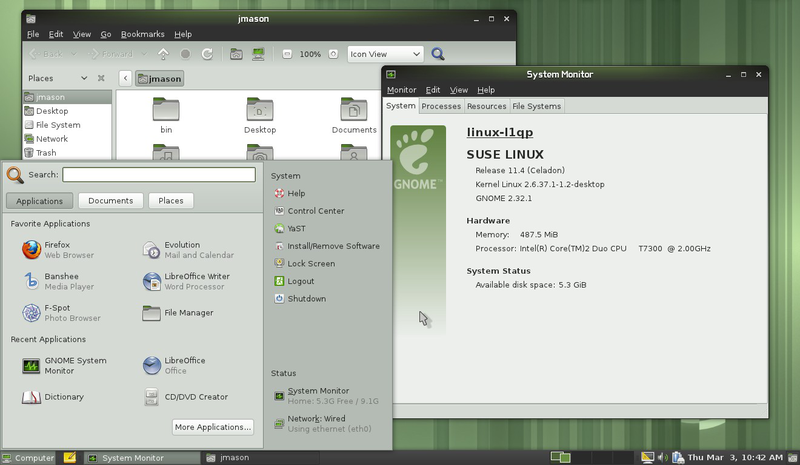 A kernel update to linux kernel-2.6.34-35 using the latest openSUSE 11.3 Milestone7 DVD, solved the problem for me. Read on for a few more details. Evidently, I did not really see the low-energy idea through to the end. If I had, I would have traded the ATX motherboard for one of the mini-ITX LG1156 motherboards from ZOTAC. The installation from an openSUSE 11.2 DVD completed without problems. It was only on the first boot-up, that the problem with the integrated Intel HD Graphics became apparent. The system attempted to start the X server, but just flashed the screen a few times and then reverted to a console login. Reading some more information on the internet revealed that the problem could most likely be solved by a kernel upgrade and/or that of the xf86-video-intel graphics driver. The trouble is, that the most current kernel for openSUSE 11.2 is still the kernel-2.6.31 release. So in short, the solution was to download last nights build of the very latest and greatest openSUSE 11.3 Milestone7 DVD using wget from the console. I then started YAST in the graphical console mode and added the openSUSE 11.3-Milestone7-DVD iso-file as a repository. After this, the new kernel-2.6.34.35 shows up in the normal YAST Software Management tool, and can be installed like any other package. A reboot of the system presented me with the lovely green login-screen of an openSUSE 11.2 installation. The graphics now work, wobbly windows, animations, cube-switcher and all. The current kernel is 2.6.34-35-default. Notice, that I haven’t yet upgraded the xf86-video-intel driver. I am going to do that next , just for fun.